As I have already share with you how building emails list can increase your visitors, so here I am going to share with you free email list service provider, that's why you can get start collecting emails for benefit of your blog, actually there are many email marketing service providers, but I will suggest you to use free one if you will get benefit from this then start using paid, there is always some benefits for using paid one than free one. 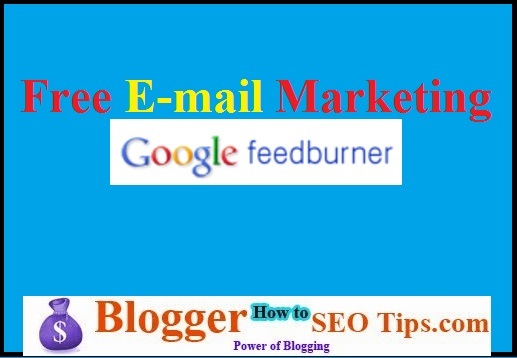 Actually, I am using now a free email marketing service, the free email marketing service provider is Google, yes Google is providing free email marketing service as a name of Feed burner. Feed burner is the most popular free email service provider, many using this service for making more money, because this service will increase blog readers, may be you are thinking it would be quiet difficult to use this but in reality it is quiet easy to use. I know, may be you know what is E-mail marketing but it is also possible you don't know, okay let me tell about e-mail marketing is short. Actually its way to let people know about your new activity, may be you have created a new blog post, or may be your company provided new discount like e-commerce company does. But, for notifying people about this, you need to have a media to add more people on your list for spread words on more people as well as you need to send them your message with minimum cost, here e-mail marketing comes up. When I have entered in email marketing in that time I did not know much about feed burner and how to collect more emails addresses from existing visitors, I will also share with you the tips I have used to collect more emails from existing visitors. Actually when I enter into any new thing, I always looking for free service because in the first attempt, you do mistakes, so use free one and get experienced and then start using paid one. Personally I like feed burner, but many marketers don't like this service and they used other paid email marketing service. I will recommend you to use this service first then move to paid service if this will helpful for you, I know it will help you. Let's do talk about some thing important about email marketing, actually this is one of the fastest way to get response from users, that's why many marketers used email marketing, but here is the problem with email marketing, in email marketing you will get response from 3 to 15% only. But, still I think this is good even reason behind this is it's too cheap, for an example let's assume you will collect 500 emails addresses in one month, then after one month if you will create a post then according to above stats you will get visitors about 15 to 150 visitors for creating a one blog posts right. Now just think this about one month you will get about 450 to 4500 visitors now you can easily calculate that how much your earning will increase for using only one month this free service now think about this effect after just a year. May be you want to know what you need to use this free service, you need only an account of Google that is Gmail account and you can directly signup for using this service for you blog. So, go for it and start getting benefit of using this free service provided by Google!! There are many companies provided e-mail marketing services but only few of them are popular like Aweber. These guys are using Aweber for their list building as well as sending e-mails, well I have full proof method to make huge e-mail list. Yes, there are many features you can not get with this one, like custom design, custom landing page, linking e-book and there are few others too. Almost everything you can get these pro services but make sure you have right budget because you have to pay for their service but yes you can get trial account of Mail Chimp and of course now a days Get Response also giving the same. E-mail marketing is the real meat to your business, even top bloggers like John Chow told in many interviews, seminars that his no. 1 mistakes was, he did not collected e-mail addresses. But, you don't need to repeat it again just go for it and enjoy traffic coming to your blog and everybody knows traffic equals money. Is there anything would you like to add About E-mail Marketing? This is given a good support for Email marketing. I read this whole article. Actually that is great work friend. Thanks @Rugby Use this service and get more traffic to blog for free. That’s true it is give good idea about Email marketing. I let known unknown things with this article. Great, Use this tips in your business.